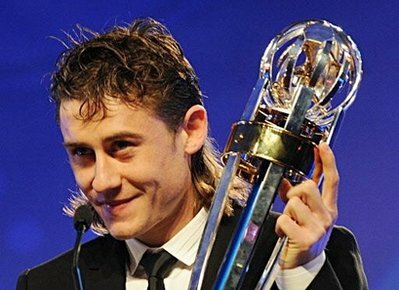 SHANGHAI - Uzbekistan's midfielder Server Djeparov was crowned the 2008 AFC Player of the Year during a glittering award ceremony here on Tuesday. Japan turned out the biggest winners on Tuesday with the East Asian nation taking top honors in five of the 13 categories although the Uzbek star emerging as Asia's finest footballer ahead of Yasuhito Endo prevented 2008 AFC Champions League champions Gamba Osaka completing a hat-trick of accolades. 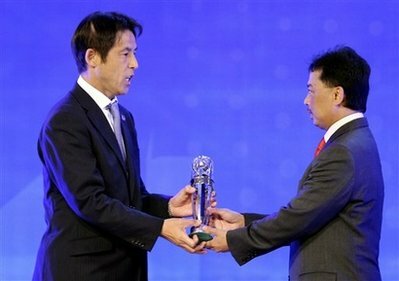 Nishino, left, is presented the trophy of Coach of the Year 2008 by AFC vice president Tengku Abdullah, right, during the award ceremony of the Asian Football Confederation (AFC) Annual Awards Tuesday, Nov. 25, 2008 in Shanghai, China. Gamba's victorious ACL campaign saw the Japanese club named the 2008 AFC Club Team of the Year while long-serving manager Akira Nishino won the AFC Coach of the Year. Japan's impressive 2010 FIFA World Cup qualifying campaign contributed to the Blue Samurai winning the AFC National Team of the Year, while the Japanese Football Association were also honored with the AFC Fair Play Association of the Year. The late Ken Naganuma, who passed away in June at the age of 77, was posthumously awarded with the prestigious AFC Diamond of Asia, which was presented to his wife Yumiko and daughter Rie, beginning the trophy trail for Japan's representatives. Among his many achievements, Naganuma led Japan to the 1968 Olympic bronze medal as head coach of the national team while as a top level administrator he was one of the driving forces behind the creation of the J. League, considered by many as Asia's finest domestic competition. Asian Futsal powerhouse Iran were once again named the AFC Futsal Team of the Year while Vahid Shamsaee, top scorer and MVP as the Iranians triumphed in the 2008 AFC Futsal Championship with a 4-0 win over hosts Thailand, won the AFC Futsal Player of the Year. Iran's success on the night was not restricted to the indoor game with the country's positive work at various administrative levels earning them the AFC Association of the Year prize. A stellar performance for champions the UAE saw AFC U-19 Championship MVP and top scorer Ahmed Khalil win the AFC Youth Player of the Year award while Uzbekistan's Ravshan Irmatov and Tammam Hamdoun from Syria were named the AFC Referee and Assistant Referee of the Year respectively. Completing the winners list is Malaysian Kamarudin Sakhari, who had the honour of being presented with the first ever AFC Match Commissioner of the Year award.